Earthquake Glue, what a true return to artistic form. That is, in the cover art department! Seriously, how cool is that damned cover? Anyway, following a string of 3 lousy LP covers, Guided by Voices returned with their 2nd Matador release in two years, following Universal Truths And Cycles. Earthquake Glue, marked the first full-on studio LP recorded with producer Todd Tobias. Tobias had become Pollard's official partner-in-crime as 1/3 of Circus Devils back with their 2001 debut Ringworm Interiors. By 2003, Pollard had granted full production to Tobias, and subsequent Pollard solo LPs, and side-projects where soon to follow. Earthquake Glue is a prog-pop weighted LP, damaged by some odd, overly long filler, somewhat sci-fi soundscape production. 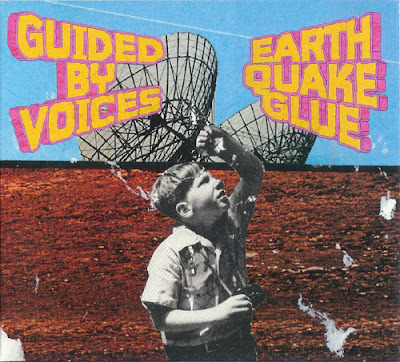 It seems as though Pollard and Todd Tobias were enamored with their various other production products that had been released previously, and thus, Earthquake Glue suffered an unjust influence that prior Guided by Voices LPs had not. Also, for the obsessives, 12 demo versions of the tracks off the LP were released a year later as a limited run LP under the Robert Pollard moniker, Edison's Demos. My Kind of Soldier- 5 Mid-tempo track complete with skyward fluid riffs, and damn good hooks. Bright, and melodic. Extended instrumental outro is killer. Pounds you on the skull until you find yourself grinning. Vintage, streamlined mid-90s UTBUTS era song. My Son, My Secretary, My Country- 2 Lo-fi/mid-fi weirdness amounts to what is essentially a cluttered throw-away track, and a disappointing follow-up to such a potent opening . Almost sounds like a Neutral Milk Hotel song during the first half with surreal Pollard arena melodies over them. I’ll Replace You With Machines- 3 Arena rock muddled up with some crappy sound effects, and mechanical dripping of some sort. Not bad at it’s core. It is relatively catchy and has a decent chorus, just bright enough to tap a toe along. This one may be chalked up to that damn Todd Tobias starting to ruin tracks with his damned production (sorry, Todd). She Goes Off At Night- 3 Progged up arena rock, with rolling drums and gargantuan guitar accents at times. But wait, watch out for some feathery, instrumentation interjections in the chorus. Not terrible, but fairly hum-drum and over-exaggerated. Beat Your Wings- 2 The long one, at nearly 5 minutes. Minor chord, crunchy balladry sans weeping piano or a string section that might have popped up if this were on, say Isolation Drills. Pollard sounds a bit out of tune, and honestly it's tough not to tune out by the end of this plodder. Useless Inventions- 5 Great hooks, upbeat. Whistleable and foot stompingly fantastic. Well, mildly foot stomping. Don’t want anyone to get hurt. The verses are simple and slightly better than the chorus, which is usually a let down, but this is one hell of a song. Dirty Water- 1 Uselessly boring and murky. Congested with Todd Tobias weird sound-effects, and an obnoxious amount of guitar whammying about. The Best of Jill Hives- 5 Amazingly airy and downright beautiful. Such a simple vocal melody covering steady melodic guitar downstrokes. A well-celebrated single off the LP, deservedly so. Dead Cloud- 1 Dead on arrival. The very definition of herky jerky, complete with awkward construction. this song proves a frustrating listen all around. And it doesn't help that Pollard sounds like he just got the wind knocked right out of him. One of those songs that has no dynamics in the most boring way possible. Mix Up the Satellite- 3 Spacey, proggy, pretty strange but oddly soothing. Almost a terrible song, but is somehow subtly catchy. Lyrics are extremely cheesy and the synths sound dated it to 15 years before this song came out. Still kind of enjoyable. One of those that inexplicably pops in your head from time to time. Main Street Wizards- 4 Bumpy territory instrumentally wise on the verses, but tight and melodically simple, enjoyable choruses. Definitely on the space-rock, easy listening territory. This all can be slightly off-putting, but this track proves itself a later-era album stand-out track. A Trophy Mule in Particular- 2 Grandiose marching snare, skyrocketing synths, and pensive surreal lyrics all add up to…. ehhh. Apology in Advance- 2 Awkwardly arranged chords, slapdashed together. Verses reveal little of worth. The chorus meanders on. Odd stops and starts. Stream of consciousness rambling feel, but if your consciousness had literally JUST stopped listening to a lot of mid-‘70s Who. Secret Star- 3 Refreshing streamlined tempo and beat start the song after a smattering of scattered stop-start, prog tracks. However, this song suffers from being too long and dull. No dynamics during the first part, it boasts a progged up reflective bridge, and a punchy outro that fails to deliver the big punch. Almost a great song, but unfortunately too many short comings to get there. Of Mites and Men- 2 Snotty attitude coupled with warbled guitar flanging. But this song fails to go anywhere. No real memorable parts. Unfortunate background music to close out a lackluster and difficult to process LP. I love the part in "I"ll Replace you with Machines" where he sings "And so I wrote a letter ..."
And "Best of Jill Hives" sounds like the best Beatles song from an alternate universe. I'm sorry but Dead Cloud is one hell of track and I absolutely love it. It's all weird and broken, but the dynamics are sublime (it's definitely a 4 to me). Anyway that's the only track on which I don't agree with your opinion. My Kind of Soldier, Useless Inventions and Best of Jill Hives are really the keepers on the record. "beat your wings" really does go on and on. enough already.